Not Sure Which Profile You Need? Let Us Identify Your Gasket! Not sure where to find your serial number? We are finding the right replacement gasket for you, please wait . . . Shoot! We were not able to suggest a replacement gasket with the information you provided. Try removing dashes and/or anything before the dash and just provide the last part of the serial numbers. Want to make it easy? Give us a call at 855-288-2259 and we will help you find the right replacement gasket! If you are not happy with your gasket, we will gladly replace the gasket within 30 days of your order. Important Note: This gasket may be used to replace models and OEM parts as described below; however, we cannot guarantee compatibility with your unit based on model number alone. If you are not sure of the gasket you need, please contact us and we can walk you through making sure you get the right gasket. The best way to confirm you are ordering the right gasket is to confirm the size of the gasket you need and also the profile of the gasket you need. 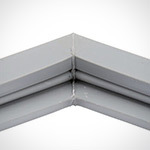 (Our measurements are always outside edge to outside edge on the website). The most versatile PVC material. Very durable. Minimizes scratches, and prolongs visibility. 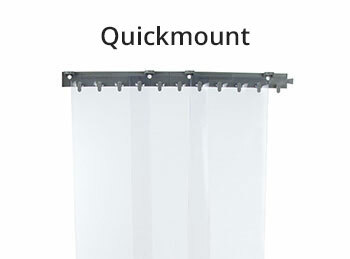 This lightweight, durable and easy to install ''QuickMount'' replacement strip curtain hardware holds strips tightly in place preventing accidental removal. This bracket comes in 2 FT lengths. Used primarily for 6" wide strips. 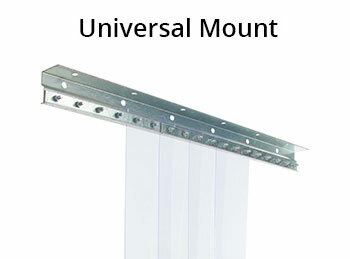 This 8 FT aluminum mounting bracket is used for easy mount of 6" or 8" wide smooth strips. Also referred to as a "G-Bar" this bracket allows strips to slide in and hold in place. 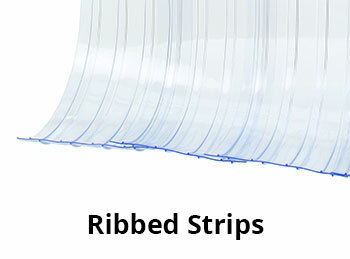 Strips have 7/8" shoulders with the tops tabbed for easy slide-in installation. The most popular bracket sold. 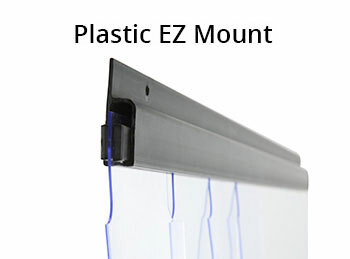 This 8 FT plastic bracket can easily be cut down based on the width of the door. Used for easy mount of 6" or 8" wide smooth strips. Also referred to as a "G-Bar" this bracket allows strips to slide in and hold in place. 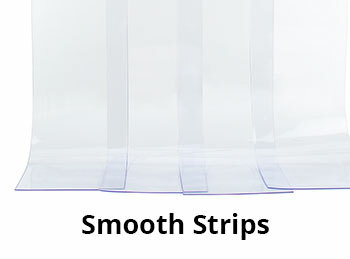 Strips have 7/8" shoulders with the tops tabbed for easy slide-in installation. The durable, versatile EconoTrack bracket can be used for both surface and in-jamb mounting on small or very large openings. EconoTrack's formed steel face plate holds strips firmly while allowing flex without breaking. These rugged brackets are constructed with 14 gauge galvanized steel with 1/4" studs. Face plates are formed in 12" sections for easy strip replacement. 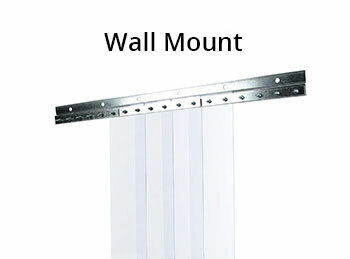 Comes in 3, 4, or 5 FT lengths, with the option to mount to the ceiling or the wall. 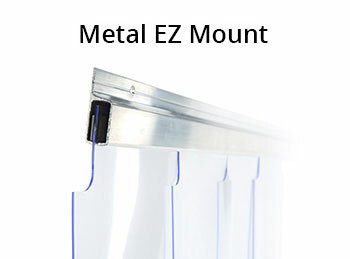 Same style as the Universal Mount, but with the option to only mount to the wall. Used for heavy duty applications. All cooler/freezer strip options work on this bracket. Available in 3, 4, or 5 FT lengths. The most popular, the edges of the board are square and have been finshed (deburred) so they are safe to handle. We will round the edges so they are not square, often referred to as rounded. Not very common, this is just like it says. No finishing, edges are sharp. Typically people use this option in custom applications. The most popular, the corners are square (90 degrees) and have been finshed so they are safe to handle. The corners are rounded at about a 1/2" radius. Typically people will round the corners if they walk past the board often in a commercial kitchen. Not very common, there is no finishing and the corner is sharp. Also commonly referred to as juice troughs, juice grooves are one of our most requested customizations. We simply route a small trough around the perimeter of your board to catch drippings from carving meat. Never worry about buying that gasket again! When your gasket fails and you need to replace it, we've got your back for life. We provide the replacement for free. You only pay shipping cost. You'll get the same high quality gaskets that we're proud of, with the fast turnaround that you need. 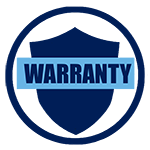 When you need your replacement, just call us with your original order number and we'll place the warranty order for you. Still have questions? 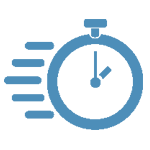 Check out our FAQ page. 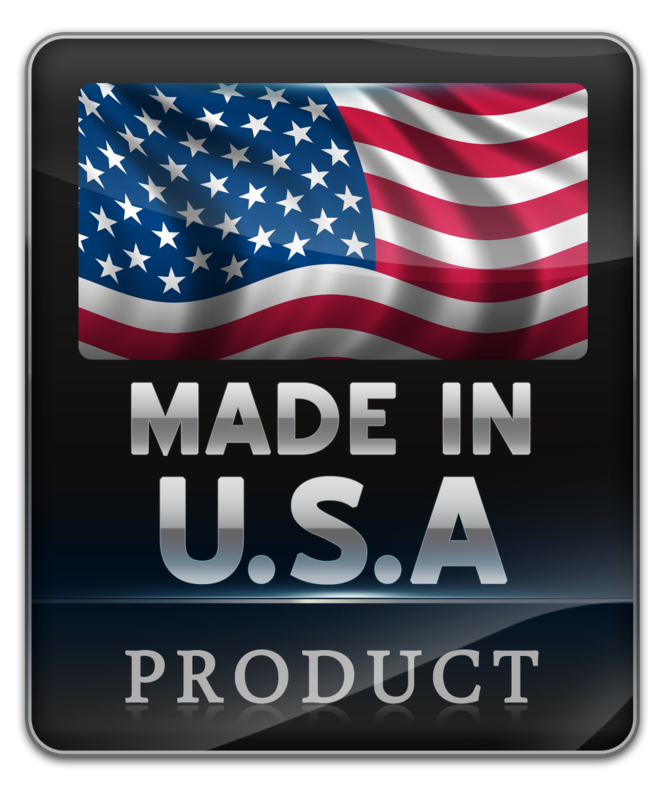 To qualify for our Free Shipping program orders must contain $150 in refrigeration gaskets. Cutting Boards, Strip Curtains and Refrigeration Hardware products are not counted towards the $150 free shipping offer.